This past Thursday I went on a three-pronged trip while down in the centre of the country. I began my adventure in Ramat Gan, just outside of Tel Aviv, buying pastries and an iced coffee before hopping on a bus out of the city. 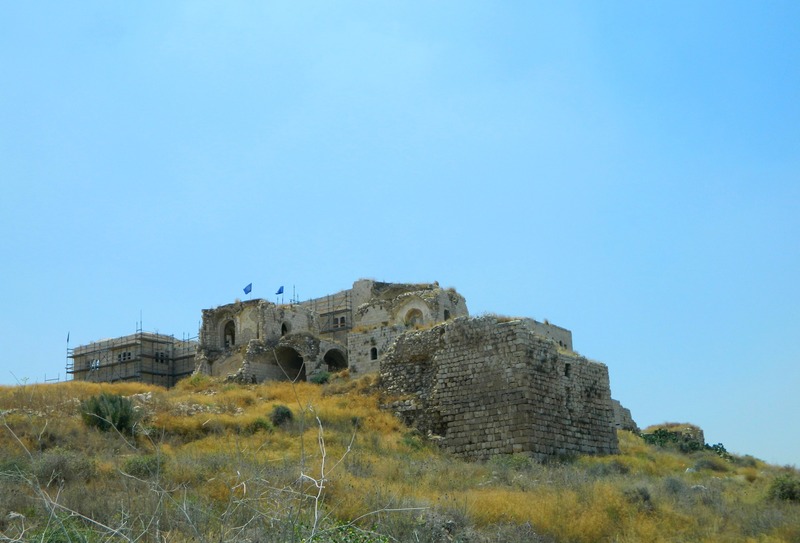 I then took another bus which dropped me off near the entrance of Rosh HaAyin, a city bordering the Shomron (Samaria), where I walked a little ways through a construction site, heading for the Crusader castle of Mirabel. I had heard from a friend that the site was under construction and closed to visitors, and hoped that there would be nobody there when I arrived, but, there was, in fact, a lone man holding watch over the ruins. 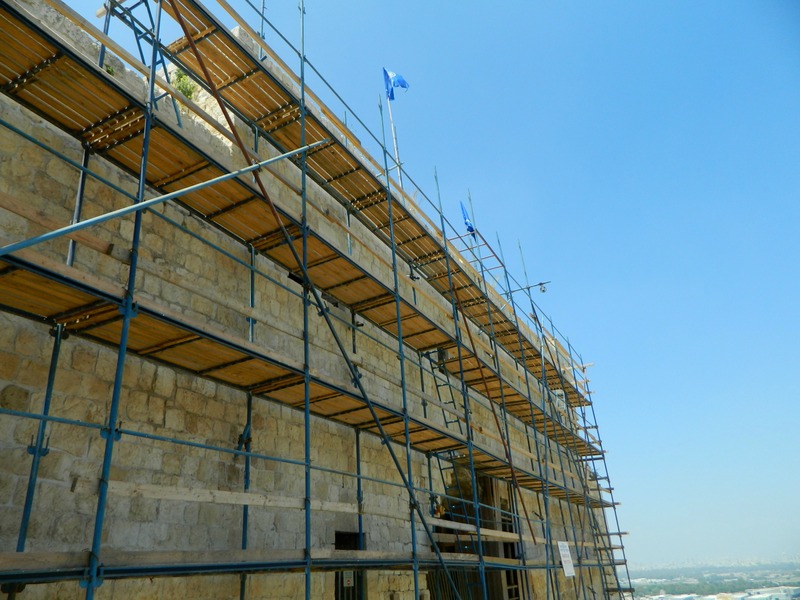 I passed the scaffolding-decorated walls and entered the castle’s interior. The following conversation was short and successful with the man returning to sit in a doorway, leaving me to explore Mirabel unhindered. 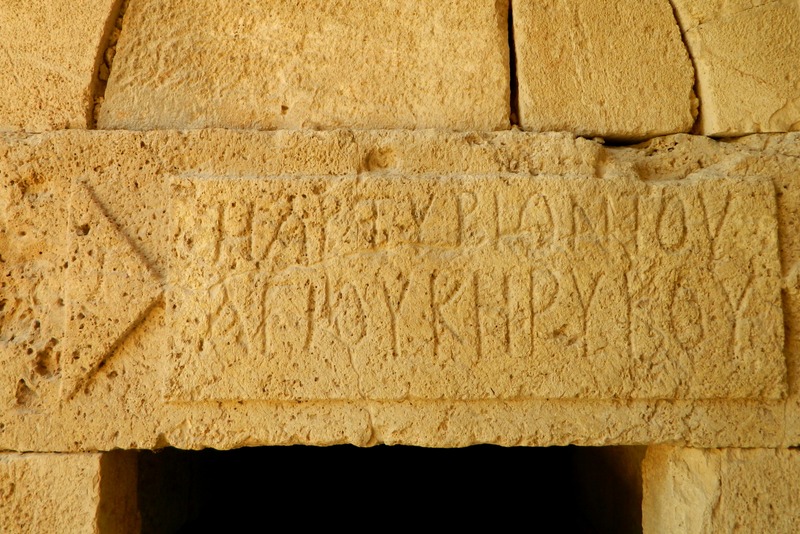 The first thing to really catch my eye was a large lintel stone inscribed with Greek lettering delineating a Byzantine church. 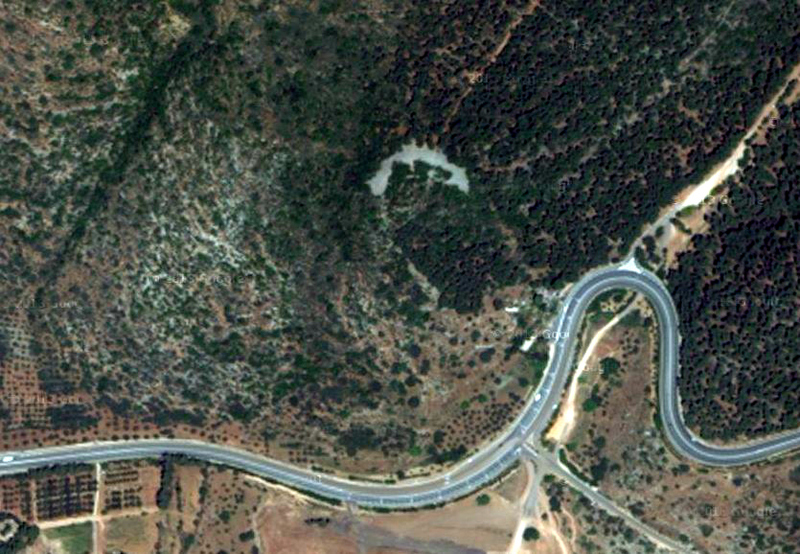 Migdal Afeq served an important role in protecting the ancient trade route from Egypt to Syria, known as the Via Maris. 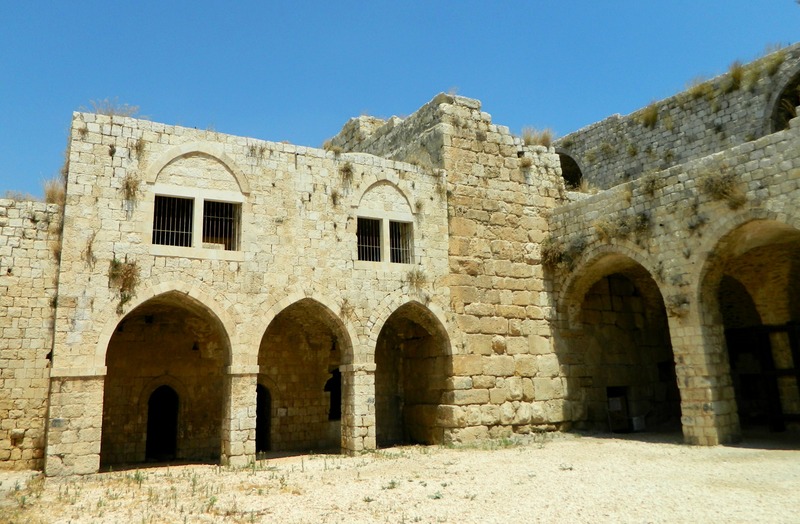 However, whatever stood at Migdal Afeq in those times was only ever a satellite to the much more important Tel Afeq, just a few kilometres to the northwest (although not to be confused with Tel Afeq at Ein Afeq between Akko and Haifa). 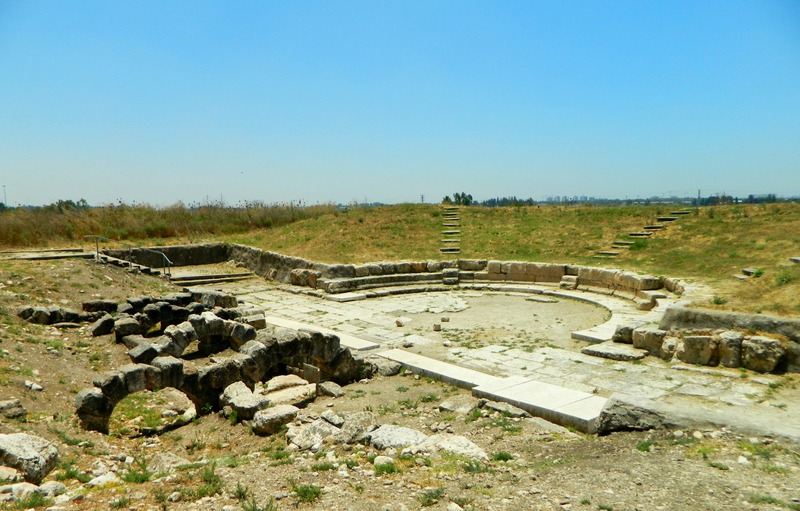 During the Roman period a Jewish village existed, and during the Great Revolt, was destroyed by Cestius Gallus and the 12th Legion. 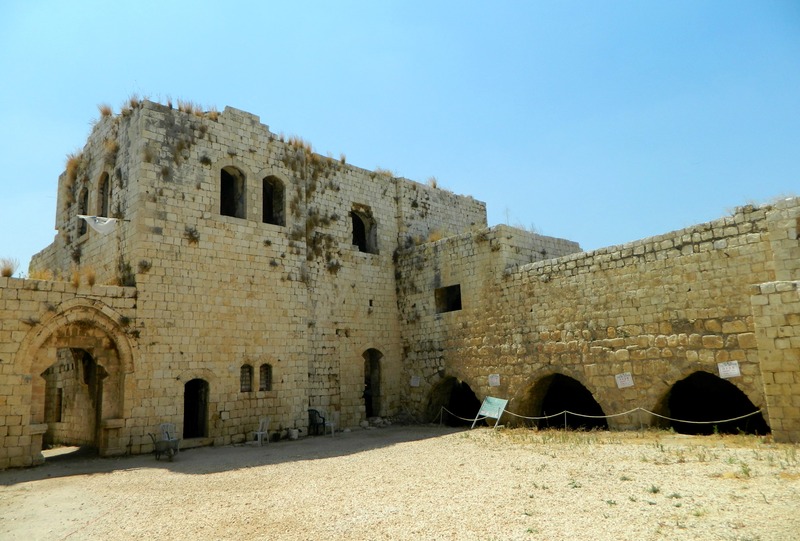 In Crusader times the castle known as Mirabel was constructed after the land was gifted to Balian of Ibelin, the founder of the Ibelin dynasty, by King Fulk of Jerusalem. 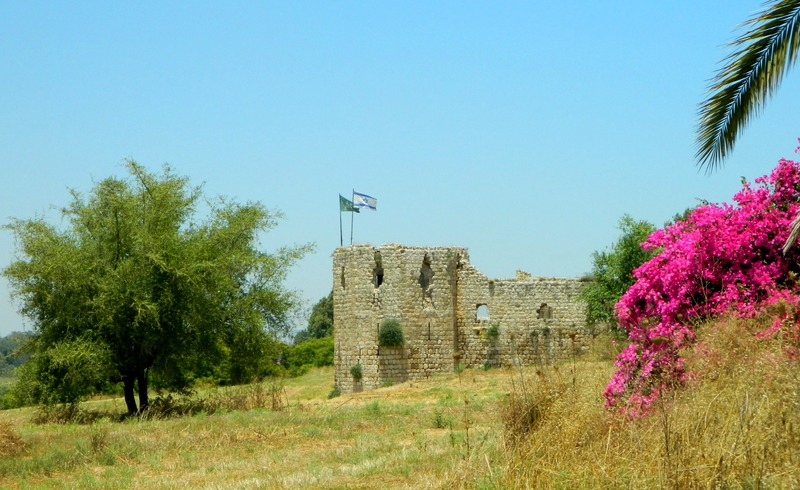 Interestingly enough, Ibelin is just a corruption of the ancient Jewish Yavne and to this day there is an Arab village near Haifa called I’billin and I wonder if it’s not named after the once-powerful Frankish family. 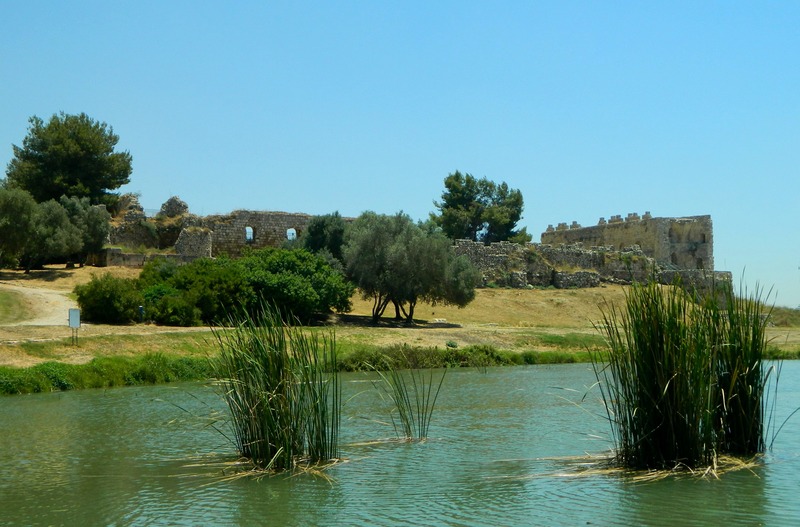 Mirabel was captured by Saladin’s brother in 1187 and the castle was used by the Ayyubid forces until 1191 when Saladin ordered the castle destroyed in preparation for the Third Crusade. 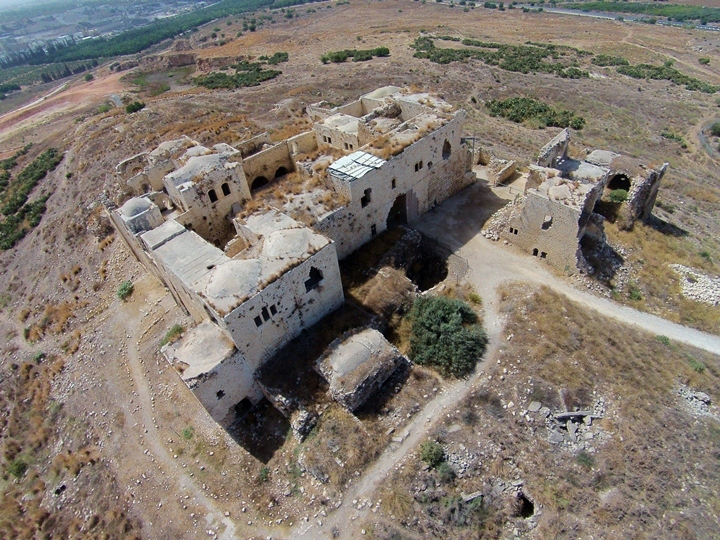 Most of the ruins seen today were built by the Ottomans, although some parts (including the keep seen in the photo below) are original Crusader construction – identifiable by the larger ashlars used in building. 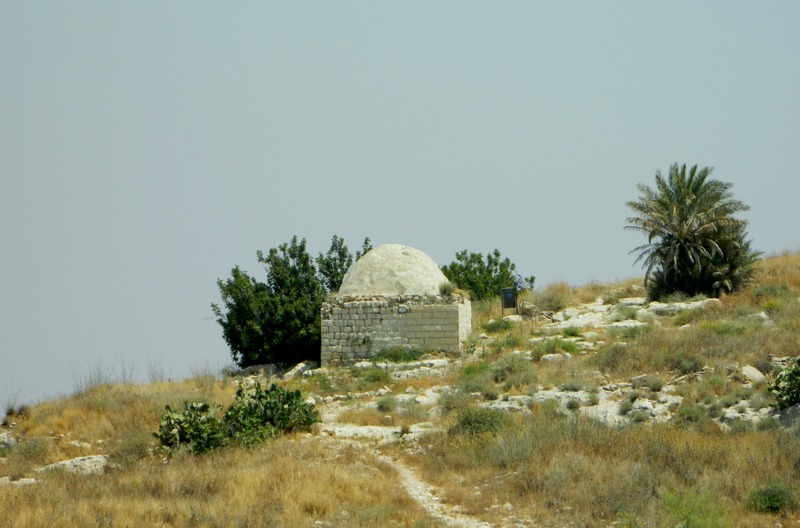 In the 1800’s, Bedouins settled around the fortress and called their village Majdal al-Sadiq, named after their leader whose domed tomb surrounded by other graves still stands on an adjacent hill. When I was finished exploring the site, being careful around the construction areas, I asked the watchman when he imagined the archaeologists would arrive. 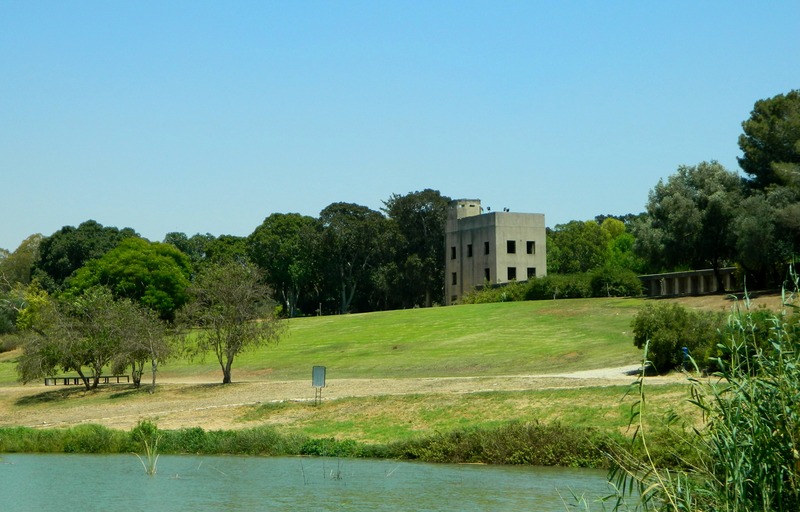 I waited around for a bit, taking the time to explore the outside of the castle, passing what seemed to be a water cistern just outside the castle wall. One interesting thing that I saw was this set of old lime kilns with an old quarry in the background. Apparently, the limestone quarried from here was used to build the white stoned-buildings of old Tel Aviv from the 1920’s through the 1940’s. Returning to the castle’s interior, I greeted some arriving men only to find out that they were the construction crew and their foreman. Just blending in to the environment I was able to learn a little about the reconstruction process of ancient castles. 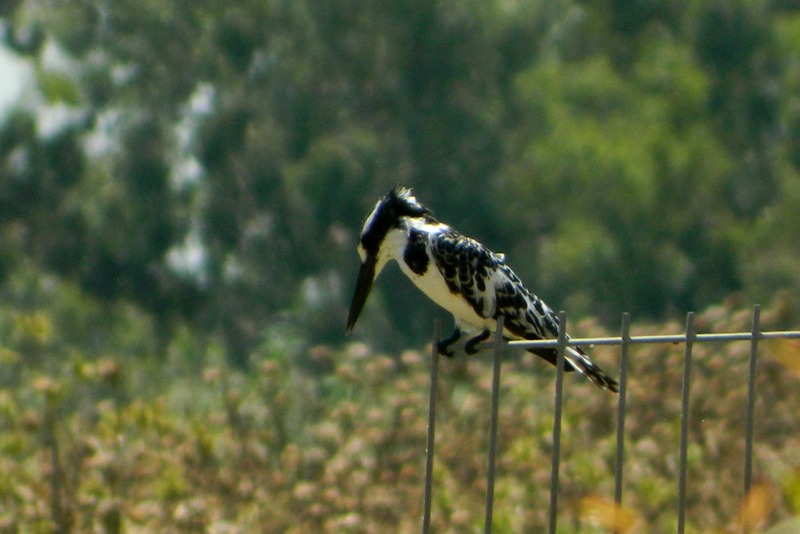 The other week I took a bus to Karmiel one morning and then another bus heading east to Kibbutz Parod. I had a whole slew of places to visit and explore, starting with a megalithic mound known as Jethro Cairn (or Gal Yitro, in Hebrew). Approximately 500 feet (150 metres) long and 66 feet (20 metres) wide, this crescent-shaped pile of lichen-spotted rocks made news last year when findings were announced by Hebrew University PhD student Ido Wachtel, naming it older than the Pyramids and Stonehenge, as seen HERE in an article by Live Science. 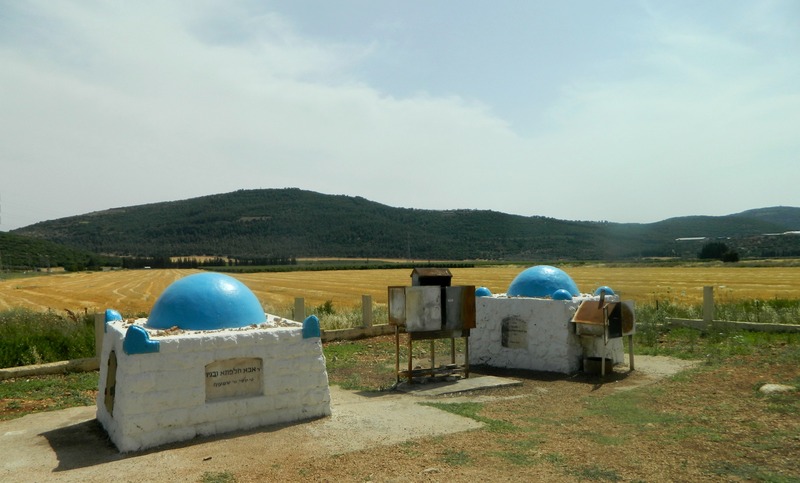 Believing the site to be a monument consecrated to the pagan moon god Sin, there is also a religious connection to the Druze people who live locally in the Galilee and Golan. 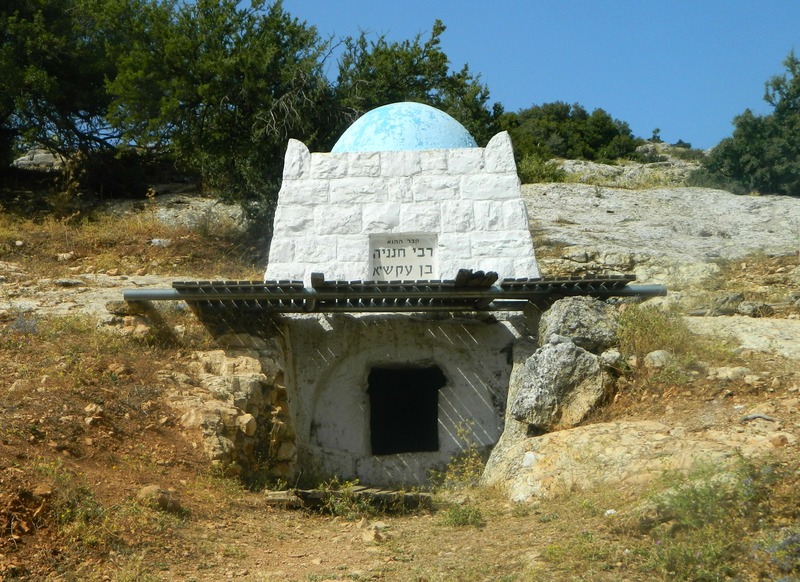 Historically, if a Druze had trouble making the annual pilgrimage to the shrine of al-Nabi Shu’ayb (what they believe is the Biblical Jethro’s tomb located not far from Mount Arbel), he would make do with visiting Jethro Cairn. 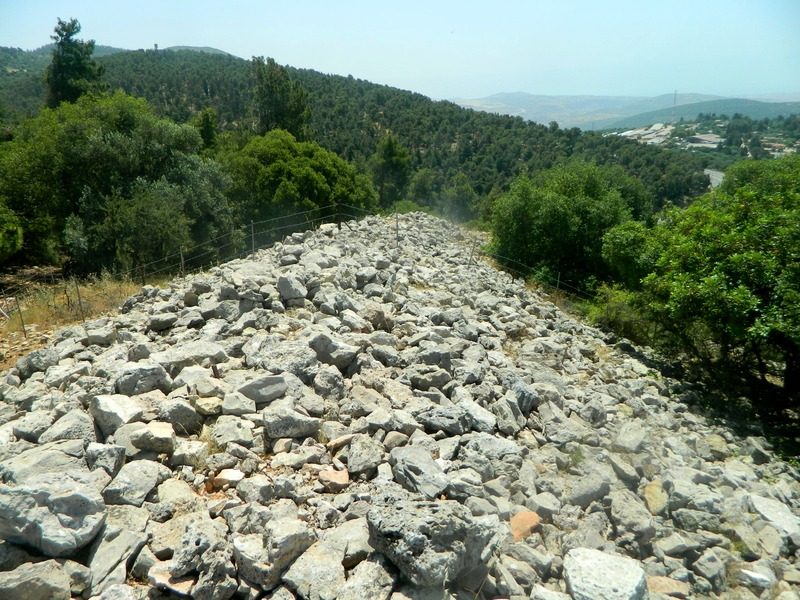 Starting from the fragrant pine forest along the road, I climbed up the hill in search for the cairn. Up and up I went, even crossing through an inconvenient barbed wire fence – the first of many to hamper my explorations that day. At last I reached the large mound of rocks, and walked the entire length of the crescent, taking in the view including a Tegart fort in the distance to the east. That irksome barbed wire fence even found its way cutting across the cairn. When I reached the other end I found an easier way down the hill and made my way to the dry streambed of Nachal Tzalmon. Following the trail I passed the access road to Parod and found a sign naming the path as the Parod Falls Trail, with a series of things to see. 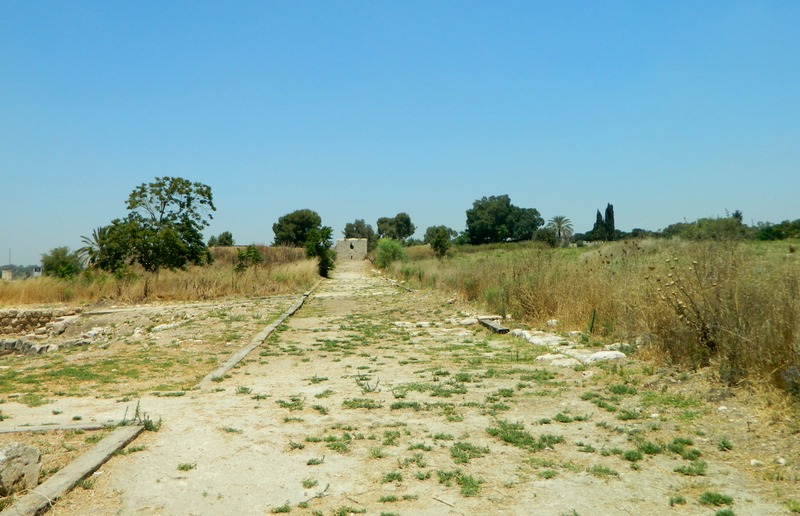 Starting with a small aqueduct I came across two keverim (graves) of sages: R’ Nechemya HaAmusi and R’ Yishmael. 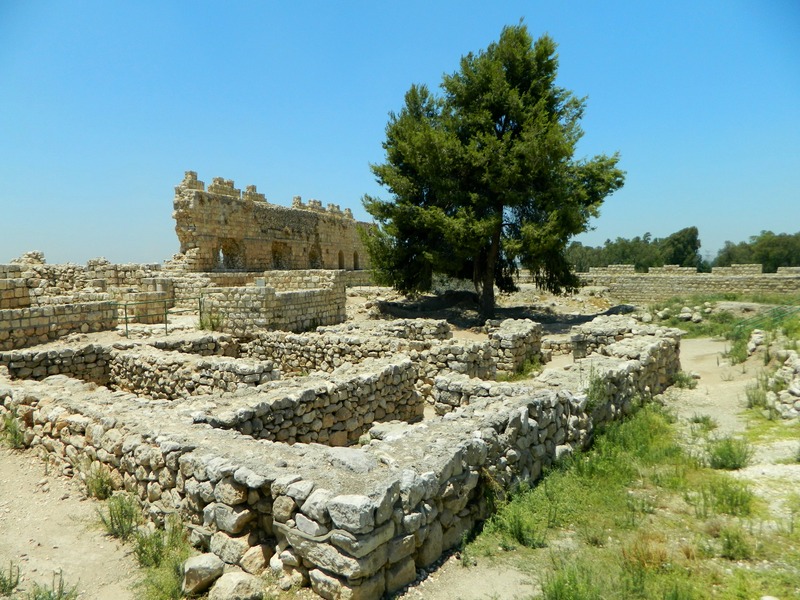 Both having lived in the Roman period when the Second Temple was destroyed, these Tannaim likely lived in the nearby ancient Jewish villages that I came to see. After some quick prayers I carried on, walking along the stream which, at this time of year, only had small puddles of water between the numerous tiny would-be falls. I passed two caves, ancient agricultural terraces and an ancient flour mill before reaching a gate on a dirt road. 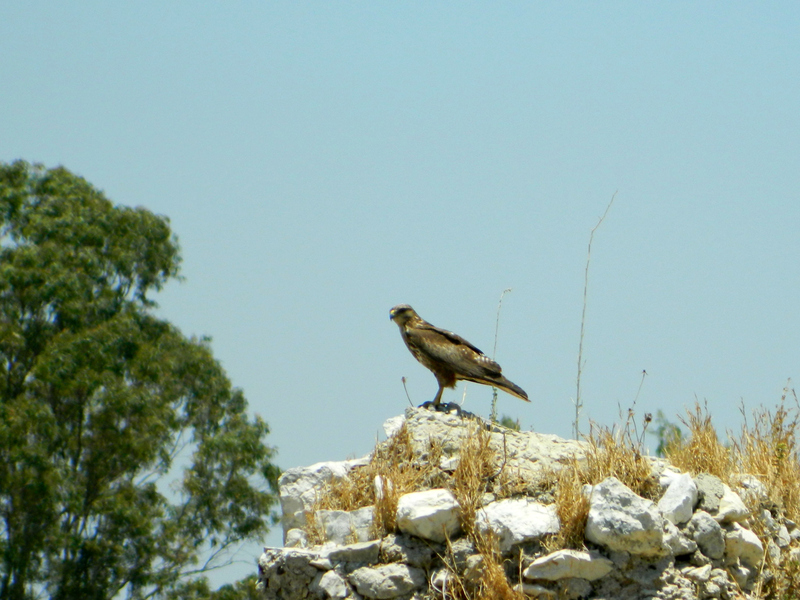 Climbing it, I turned out of the stream’s valley to hike up a hill to the west – Tel Be’er Sheva of the Galilee. 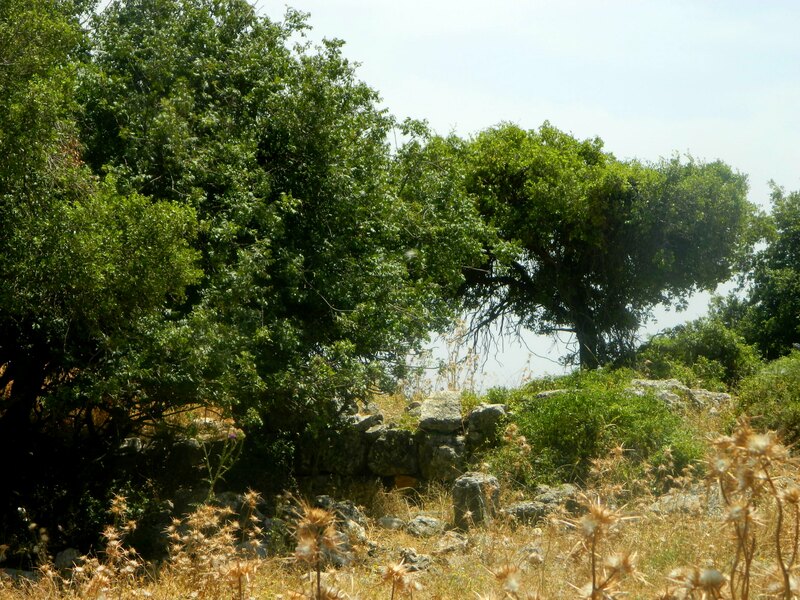 Not to be confused with Tel Be’er Sheva in the Negev, this hill in the Galilee was once the home of a vibrant Jewish village prior to the Great Revolt against the Romans. And so I fought my way through the thorns and brambles, the hill’s peak coming ever closer. At last I reached the top and after surveying the peak, realised that the remains were hardly anything to be seen, just meagre wall bits beside a cow carcass. 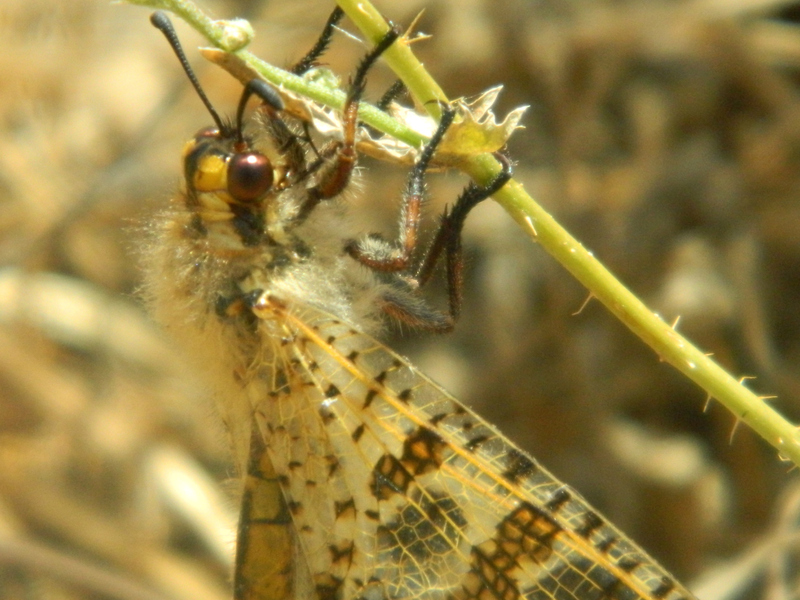 As I made my way towards the southern slope of the hill I found this mysterious insect that I haven’t yet identified, which I had seen and mentioned on my last post, Nachal Ga’aton. Walking down the southern side proved to be much nicer and I even found an interesting crystal nodule that caught my eye by glinting in the sun. At the near-bottom of the hill I found a pit that was partially closed off with fence and barrels, and, when I went inside turned out to be a necropolis with so many bones (and even a mummified puppy). 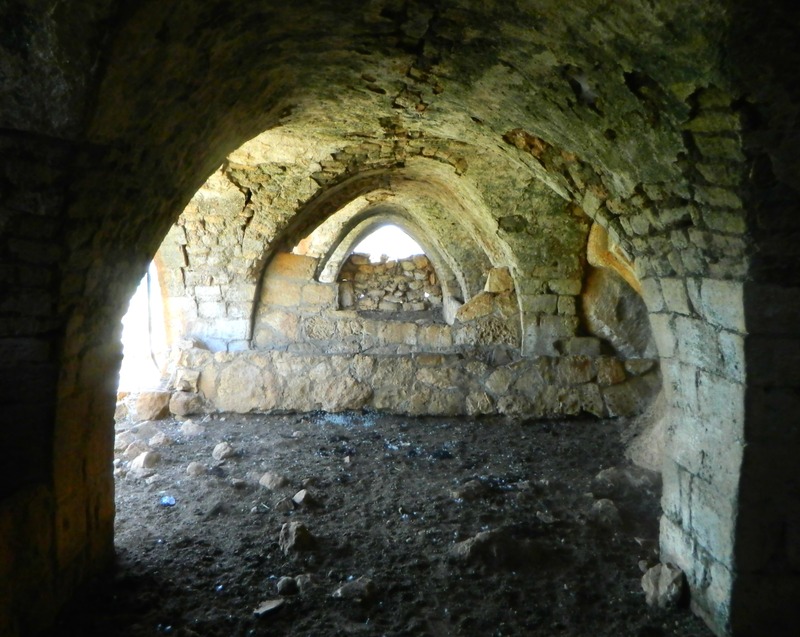 Escaping the cistern of death, I then explored the nearby Ottoman-era vaulted building of unknown purposes. 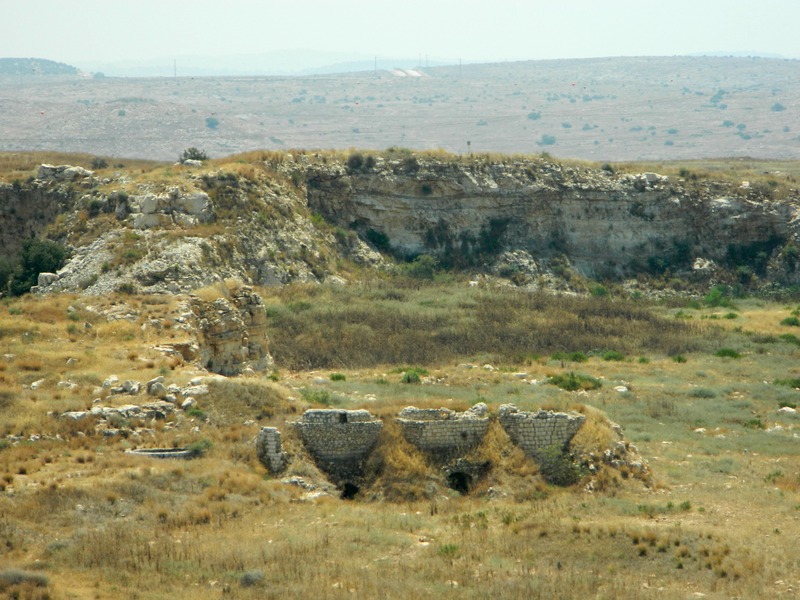 Finished with that hill, I crossed Nachal Tzalmon once again and attempted to visit another kever or two as well as the ruins of Kfar Hannania on the opposing slope. 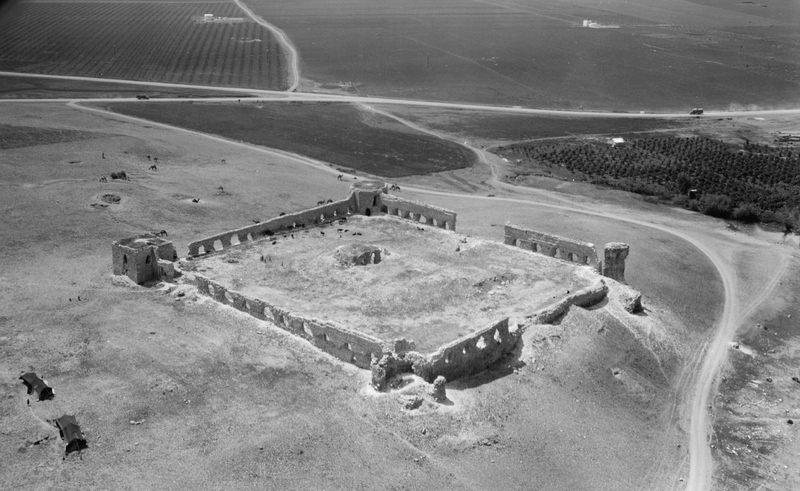 Believed to have been a just a support satellite of the fortified Be’er Sheva during the Great Revolt, eventually the populations settled in the more convenient location of Kfar Hannania, abandoning the strategic hilltop. Heading for a few visible rock walls I encountered a barbed wire fence that was too difficult to get through. I continued along the fence heading south, along the natural curve of the hill, but eventually gave up and walked back to Road 85. Crossing at the junction, I paid a visit to the keverim of R’ Abba Khalafta and his sons, R’ Yossi and R’ Shimon. 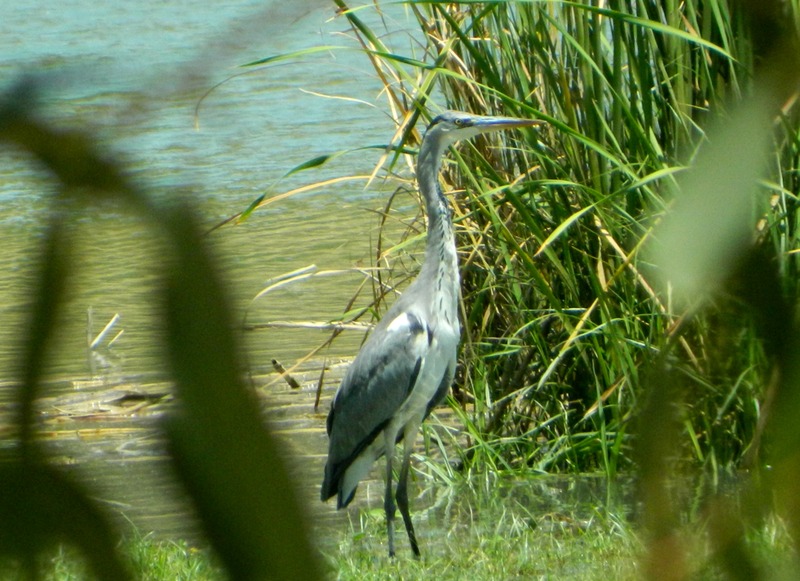 There I met the friendly caretaker who offered me cold water and drove me over to a nearby group of keverim, sparing me from the walk in the heat. 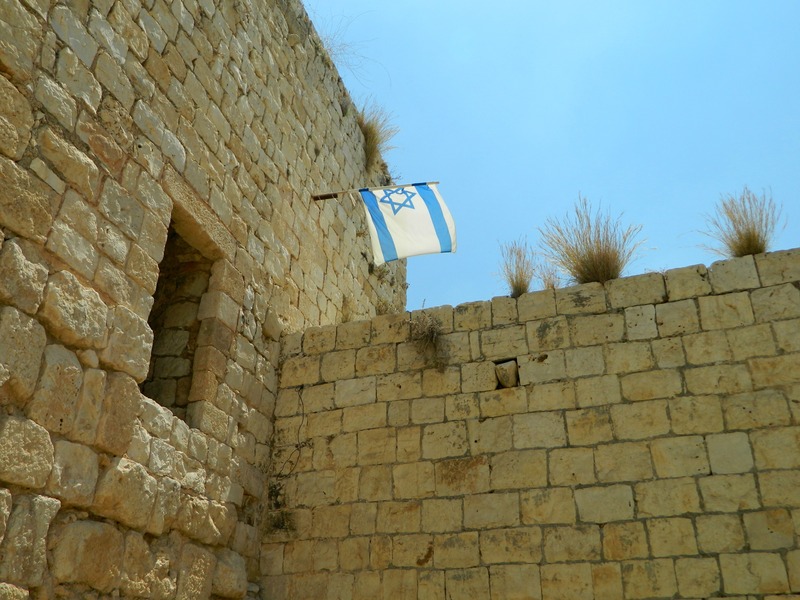 I first visited the kever of R’ Eliezer ben Ya’akov – a very interesting two-floored grave with a shallow cave where people light memorial candles. 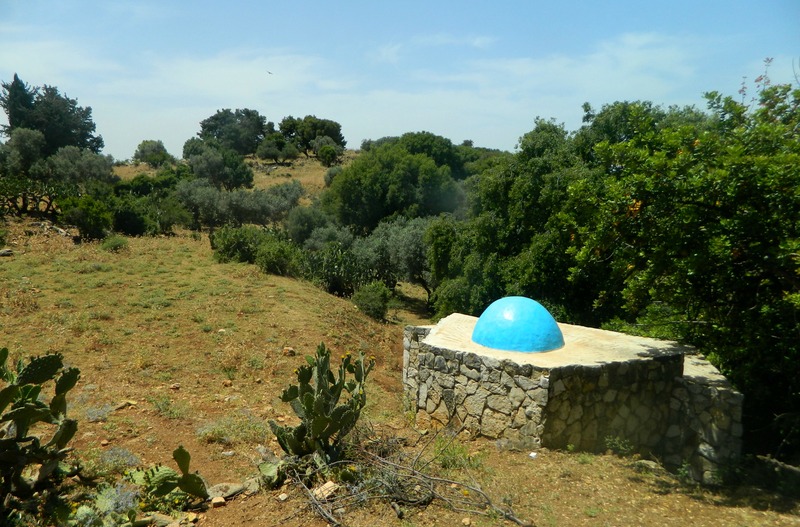 Next I walked up and nearly missed the kever of R’ Ya’akov – just a few blue painted rocks beneath a small tree covering a tiny cave. Just a few feet further I entered the mausoleum of R’ Chananya ben Akashia and his family and students. 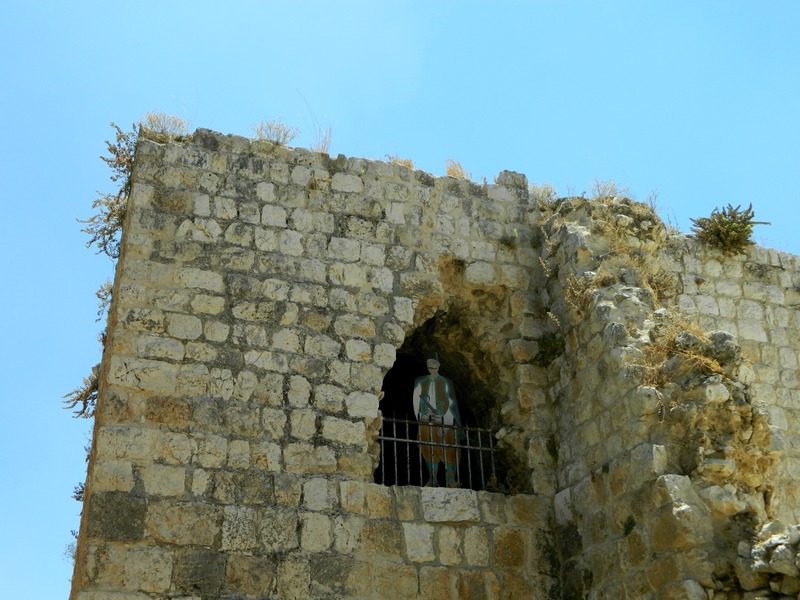 I spent a little while there and then left, passing some stone wall ruins of Kfar Hannania before reaching the bus stop that I needed to take me back to Karmiel and then back home.